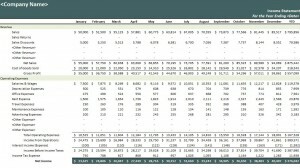 A monthly income statement is a great way to keep track of your finances and know exactly how your money is being spent. In fact, without a monthly income statement it can sometimes be exceptionally difficult to know exactly how you are spending your money. If you are on a budget, this can potentially become a problem very quickly. There is no need to sit down and write out a monthly income statement on your own. Instead, you can benefit from downloading one and utilizing it to gain better control over your finances. Finding the right statement makes all the difference. You can download one from this page completely free of charge. In addition, you can download it right away without having to sit around and wait for a long time for it to become available. Once you have downloaded it, you can start using it right away. It is designed to be easy to use, allowing you the time to focus more on the information that is contained in it instead of the technical details of it. However, if you want to customize it, the template is designed so that you can customize it at will in order to fit your specific situation. After you have downloaded it, you can use it to gain better control over your financial well being. The statement can be used to track every expense that you have and to track your income from various sources. All that is required of you is to fill in the categories and total everything out at the end of the month. You may be surprised how using a monthly income statement can improve your finances. It is often relatively easy to think that you are being careful about your spending when there is a great deal of room for improvement if you are not carefully tracking your expenses. When you put it all down on paper it is much easier to see exactly what you are doing and where you can improve. It is a way of verifying that you are doing everything in your power to ensure that you are creating a healthy financial future for yourself and those who are close to you.